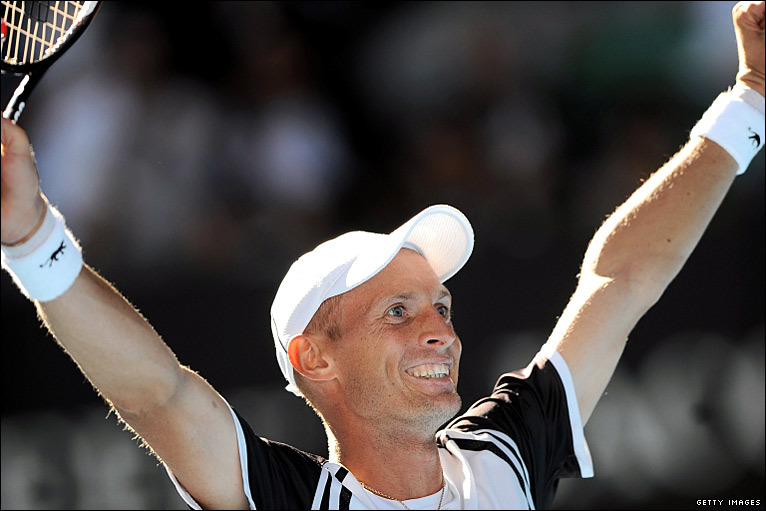 Australian Open Day Eight – Vocal Victoria wins but Local Lleyton loses out as Davydenko faces Fed. Proof again that the OZ Open consistently spits out thrilling matches at will – another five set spectacular saw the exuberant Frenchman conquer one of the men’s tour’s most underachievbing talents. Spain’s Nicolas Almagro has all the weapons to pose a threat to the top ten, his huge serve and excellent mix of grinding defence and brave shotmaking are enough to consistently worry the best – but this breakthrough has yet to happen. He was close here against the popular Tsonga but just lost out when it came to the crucial crunch points near the cusp. Tsonga should fancy his chances against Novak Djokovic in a rematch of the 2008 final where the Serb achieved his first major title. Djokovic himself has been a little wayward so far this year, but looked solid against the unseeded Lukasz Kubot of Poland, coming through in three: 6-1, 6-2, 7-5. Nikolay Davydenko was (unsurprisingly) pushed for the first time as last years semi finalist Fernado Verdasco looked to have sealed the winning momentum fighting back from two sets down only to then lose out once more in five gruelling and at times inspiring sets of tennis. The Russian will be a huge test for Federer in the quarters. The Swiss world number one was only real;ly challenged by Lleyton Hewitt in the third set where the Aussie veteran managed to break back and hold points for 5-5. Amidst the expected Serena onslaught (ousting Stosur in two easy sets) and equally expected Venus wobble (fighting past Schiavone in three) there were shocks as the latest Sharapova-clone Caroline Wozniacki lost out to Li Na of China in straight sets. It was disappointing for the Dane who’s big if graceless game should have been enough to power through. Later on it was an entertaining three way battle on Rod Laver Arena as the rather unlikeable Victoria Azarenka had to face both Vera Zvonareva and a hostile Melbourne crowd still hurting from the loss of Lleyton the previous match. The early exchanges saw the lively supports hound the Belorussian and humorously mimic her overdone ‘WOoh’ exhale with every shot. It mattered little as, just like at Roland Garros last year Azarenka ignored the justified criticism to win in three – her first victory over the brittle 9th seed. NextAustralian Open Day Nine – Different fortunes for the Andy’s as Rafa’s injury makes unwelcome return.